Basic Electronics » Do I need an H-Bridge? I'm trying to build a robot with my NerdKit. I have purchased supplies, and after doing some Internet research, now I have a question. I ran into a site that stated that if I didn't use an H-Bridge, my microprocessor would blow up. My question is, is this information true? I only need to make the motor stop and go. I don't need PWM at all. Any help would be appreciated. Your Nerdkit MCU output pins can only source around 40 mA, which is not enough for most motors, so you will need some additional circuitry to control a larger current. If you wanted to be able to reverse direction on your motor, the H-bridge would be the way to go. If not, you can just use a transistor to control a larger current source than the MCU can output. There's a good NK tutorial on just this subject that you should probably take a look at even if you only plan to turn the motor on and off vice finer control via PWM. Would I be able to use a relay and seperate power supply? You could use a separate power supply if needed, but use a common ground. A relay is also an option in place of a transistor; it would typically be used for higher power circuits, which would probably be overkill in your case. I've used the RFNP30N0GLE N channel MOSFET with the Nerdkit and it might meet your requirements: it is rated at 60V and 30 amps and can be controlled directly from your MCU. Thank You! Could you provide a link to the tutorial? I think the tutorial esoderberg was referring to is our motors and microcontrollers tutorial. HELP!!! I can't make heads or tails of the circuit, and there were no pictures. Could someone please upload a picture of what their circuit looks like? 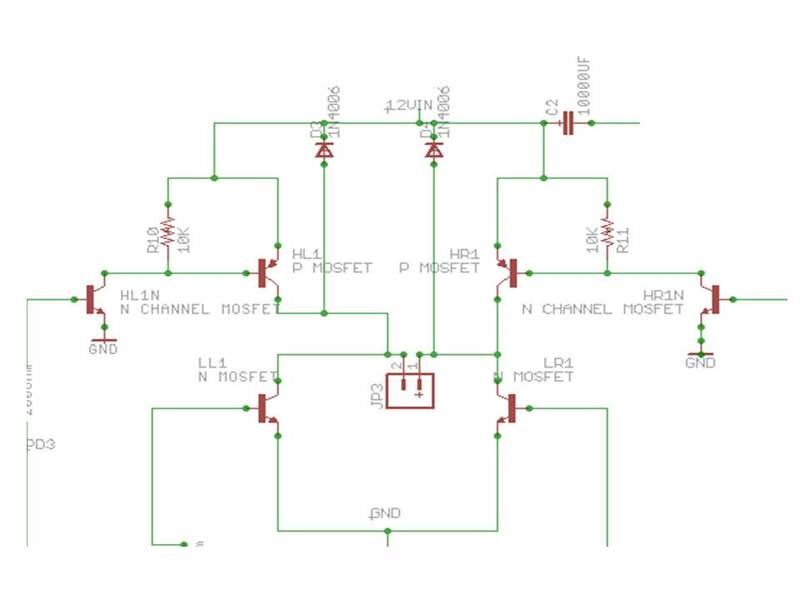 H-bridge with high side P MOSFET controlled by smaller N-MOSFET, low side controlled with straight up N-MOSFET. Except for those like me that are taciturn, idiomatically challenged almost bordering on seeming arrogance, and in general respond unnecessarily cryptically because my mind says more than my fingers type, or I present things in a manner too conceptional and not literal enough, or I'm being literal when it appears conceptual.... oh the cross I bear sometimes with how I type my thoughts.... (sighs). But I'm actually working on getting better. Yes, (to bretm in particular), I miss your input. I apologize for dampening your enthusiasm for sharing and involving yourself in projects here. I recognize that I am entirely to blame for this. I wish everyone here, a very Happy Holiday and I hope your learning and projects delight and amaze you with what you can do if giving yourself half a chance. 'conceptional' - I take credit for coining this new word, I think. Forget your meds today Boba?